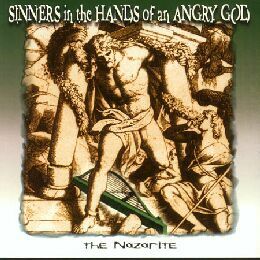 Sinners in the Hands of an Angry God is an unusual album. The production is wonderful (as should be expected from a project created by veteran CCM producer Jonathan David Brown), and the lyrical themes, though sometimes on the harsh side, are things that the Church needs to hear. The first comparison that springs to mind is Keith Green; the reliance on piano as the anchor of most of the songs, the prophetic flavor of the lyrics, and even the vocal timbre are reminiscent of Keith Green's music. The second comparison that springs to mind is Michael Card. Card also writes music with a calm, Christian-friendly sound that you wouldn't be afraid to let into your Sunday morning service, and Card also often relies heavily on Old Testament themes for inspiration. But I see a very important difference in Michael Card's lyrics and The Nazarite's lyrics; I'll get to that soon. First, the music. This stuff is beautiful. The background vocals are incredibly lush, weaving in and out of the lead vocals and carrying the listener through the song, lending each song its own personality, and yet also giving the album continuity as a whole. The piano, as I mentioned, is the bedrock of this album; even though sometimes it is barely audible in the mix, without it something would seem to be missing. An extreme example of this is "I Love Yahweh, He Heard My Cry" near the end of the album, which has an almost Bruce Hornesby-esque flavor. And all through the album are little musical touches, like the Eastern musical textures mixed with Western guitar riffs at the beginning of "Insane Babylonianz" or the interesting little bonus musical tag at the end of "Take The Law Into Your Own Hands". The album is quite obviously the work of a craftsman. Other favorite moments of mine are the way the intro to "Call Upon The Name" blooms joyfully out of the ruins of the wasted lives of the "Insane Babylonianz", and the striking male vocal harmonies in "Let Freedom Ring". The title song starts off strangely with a long reading from a chapter of the book of Ezekiel in which God reveals what the consequences of the idolatry and rebellion of the nation of Israel will be (namely, judgement and punishment). That tone runs to an extent throughout the album, although for a number of songs it is far in the background. The title of the song is taken from the title of a famous sermon written by Jonathan Edwards during a time called the Great Awakening. The main gist of the sermon is that we are all sinners, standing on the brink of annihilation by a God who is furious at us because of our sin. (There is a link to an online copy of Edwards' original sermon at the end of this review.) The sermon, as well as this song, paints a picture of a God who is in a rage over sin. "Take The Law Into Your Own Hands" is a beautiful song that encourages the listener to lean on and follow God's Word; it talks about God's blessings that fall upon the people who follow His way. "Insane Babylonianz" is based on a passage out of the book of Revelation; the song draws a vivid picture of the lifestyle and fate of the inhabitants of the "As it was in the days of Noah..." end times, which smell suspiciously like the lifestyles of the people of the time we live in ourselves. The layered vocals in this song are so cool! When I looked up at my CD player I noticed that "Insane Babylonianz" is a pretty hefty song, weighing in at five minutes and fifteen seconds (a typical song that you might hear on the radio ranges from maybe three to four minutes), but "Call Upon The Name" even beats that, with a length of almost seven minutes! Listening to it evokes a picture of Jesus preaching to a crowd of fascinated people under a tree in some village square. I particularly liked the line "Turnaround your life to Him, even when you're out on a limb (and about to saw it off)..."
At first glance that section struck me as rebellious, arrogant... yes, pompous. But in the context of the song, it's more along the lines of maybe a triage doctor or nurse. The wound is open and bleeding, the patient is dying, and there's no time to fill out the paperwork now; it's time for action. "How Long O Lord" weeps that the Children of God have not been avenged the injustices that they have faced; it particularly seems to be talking about the Christians of the Early Church, who were persecuted by the Romans, but it could apply to many times in Israelite and Church history. "O House Of Israel" is a very pretty song that would seem to me appropriate for the dedication of a temple, or the rebuilt walls of Jerusalem in Nehemiah's day, or the return from Babylonian captivity in Daniel's day, or even the reforming of the nation of Israel in the 1940's. It segues smoothly into "Let Freedom Ring", which is a reworked version of the patriotic song "My Country, 'Tis Of Thee"; I think the point of that medley is that God needs to be as important to us in the United States of America as He is (or should be) to the nation of Israel. "I Love Yahweh, He Heard My Cry" seems to be a taking to heart of several passages from the Psalms, applying them personally to events in Jonathan's life which were very unpleasant for him. It breifly describes (in thinly veiled terms) his court battle and subsequent jail sentence, but asserts that reliance on God is what brought him through. Last of all, the beautiful "Come Away My Beloved" pleads with the listener to truly put his faith and obedience in God. It is never my purpose in writing a review to harshly criticize anything about an album, but there are a few things in the lyrics on this album that I find vaguely disturbing. For example, I disagree with the notion in the title song that God is on the verge of crushing people out of existence because they reject Him or do not do what He wants them to. On the contrary, I think God weeps that His judgement will one day fall upon us at our own hands! Romans 2:5 implies that God does not send his wrath on us as much as we call it down upon ourselves. If God wanted nothing but to snuff out sin, he could have easily done that in the Garden of Eden by snuffing both Adam and Eve out of existence; instead God has endured millennia of human cruelty and abuse of His grace in hopes that some of us will seek Him and live as His children. "Take The Law Into Your Own Hands" also contains a few points that I have to disagree with. The first line is "The giving of the Law was to correct your ways..." (speaking to the Children of Israel), but Romans 5:20 says that the purpose of the Law was to increase sin, so that God could pour out His grace and counteract it, and Romans 7:7-11 says that although the Law was intended to bring life, it actually instead brought death with it, because it caused sin to spring to life. The song also implies that it is possible to obey the whole Law, which according to Romans 3:10-12 (which quotes from the Psalms) is impossible apart from grace which is received through the blood of Jesus (Romans 3:21-24). That line from the song is technically correct (by grace and faith in Jesus we are able to follow the "Law", which is embodied in the Word of God), but somehow it worries me because it could be easily misunderstood as an excuse to try to do it all without God's help, and that is the first big step into error. Though those points and others on the album are not totally incorrect, they are not quite how I see things. I think the reason stems back to that difference I mentioned between The Nazarite's view of the Bible and Michael Card's view of the Bible. Card has often written songs about things in the Old Testament, and the songs on Sinners are all about the Old Testament as well. The difference is that when Michael Card writes about, say, Abraham's trek to sacrifice his son, Card sees that event in the context of the New Testament truth that the faith of Abraham was the seed that was needed for God to sacrifice His son. Card sees the Old Testament in the light of the New. The Nazarite, on the other hand, seems to see the New Testament in the light of the Old. In places where New Testament writers would have used the term "Word of God", Brown uses the term "Law". Brown spends a lot of time talking about punishment and vengeance when the writers of the Epistles would have been talking about grace and mercy. Brown says "How long O Lord, till you... [extract from the wicked] the Price the Law demands for the sinners in your hands..." where Paul said, "The wages of sin is death; but the gift of God is eternal life through Jesus Christ our Lord." It is true that the passage that the title song was based on ends with the statement that "It is a fearful thing to fall into the hands of the living God" (and for the record, the Greek writing around the edge of the lyric sheet appears to be that statement), but it is also true that the first part of that chapter (before the passage referenced in the lyric sheet) starts out with the statement that the Law is only a "shadow" of the good things that were to come later, and not the good things themselves, and then goes on to explain that sacrifices of animals do not cleanse sins, but the blood of Jesus, when received by faith, does. I think interpreting the Old Testament can be a tricky thing, and I think that in a few instances The Nazarite failed to interpret it in all the light of the teachings of Paul and John and the other writers of the New Testament, and even Jesus Himself. If you enjoy the ministry of Keith Green, you will enjoy this album. If you like the music of Michael Card, you may like this music too. But before you take the lyrics as gospel, think them out and study the scriptures. There is nothing malevolent in the songs, but there are a few things which, interpreted incorrectly, could cause confusion for a young Christian. For a mature Christian, though, this album will provide a lot of food for thought.